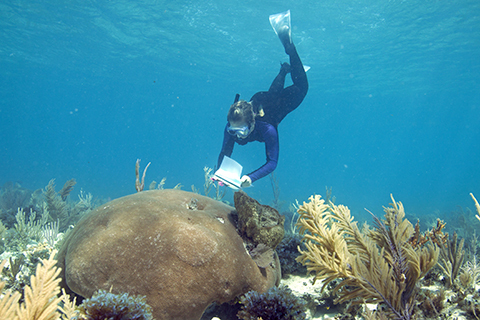 Students enrolled in the Marine Ecosystems and Society (MES) program work at the intersection of science and society, committed to assessing, managing, and conserving marine resources through innovation and research. Although course selections are tailored to match individual research and career objectives, our graduates acquire knowledge and expertise critical to ensuring the sustainability of natural resources. MES faculty expertise spans quantitative and qualitative disciplines that integrate the biological, ecological, economic, and social dimensions of marine resources and how they are shaped by policy and regulatory frameworks. The essence of the MES program lies in the diversity of our faculty and curriculum, fostering the cross- and interdisciplinary collaborations necessary to solve some of the world’s most challenging ocean conservation issues. The goal of our Ph.D. and M.S. program is to prepare students as future leaders in the fields of marine fisheries science, ecosystem modeling, aquaculture, conservation, ecosystem science, coastal geography, socioeconomics, cultural and natural resource management, climate change, environmental law, and marine policy. MES offers Doctor of Philosophy (PhD), Master of Science (MS), and Master of Professional Science (MPS) degrees. The MS degree program is designed for students interested in pursuing careers in marine policy and management, with a solid foundation in research theory and application. The PhD program is more intensive, allowing for the elaboration of research and quantitative skills with the goal of developing expertise in specialized areas of marine resource assessment and management. MS and PhD applicants must possess a BS or BA in any, relevant academic field. All applicants are also required to take the Graduate Record Examination (GRE). Those whose first language is not English must pass the Test of English as a Foreign Language (TOEFL) with a score of at least 550. All available Ph.D. research assistantships are reported here annually: Ph.D. Assistantships . Students with an express interest in working with specific MES faculty members are encouraged to reach out to those faculty directly.